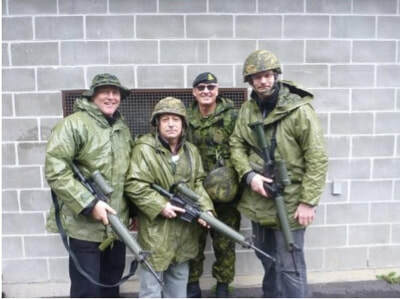 ​On Saturday April 25, the 15 Fd Artillery Regiment hosted three “Friends of the Regiment” at the Vokes Range. They observed the soldiers doing the PWT3 course, enjoyed an IMP lunch, and did a little familiarization training on the C7. Don Foster, of BMO Nesbitt-Burns, is a member of our Officers Mess. His father served with 12th Field Artillery Regiment, from the beach on D-Day to the Rhine. Stephen Welscher is a senior financial advisor with Sun Life. Al DeGenova, a well-known local Real Estate developer, was a major mover in the founding of the Honour House Society and establishing its facility in New Westminster. This event was an important first step for the Society in finding ways to thank our Friends who have contributed to the Regiment and the Society. The next Vokes Range event is in November. In September we plan to get out more invitations. Thanks to LCol Wickens for energizing this; Maj Purcell who greeted our Friends and provided briefings as well as RSM Dempsey and Warrant Porritt who supervised the shooters. For the soldiers of the Regiment, Ex CHILLIWACK COUGAR, was held to prepare troops for Ex KOOTENAY COUGAR in August 2014. Training focused on infantry skills with a PWT-3 shoot and grenade toss on 26 April, and patrolling on 27 April 2014. 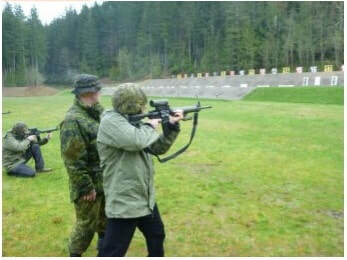 The General Vokes Range east of Chilliwack, BC was utilized for the range shoot and the OPSEE training area was used for patrolling.